With all secure parking closed we decide to head to Santiago. The scenes in the streets are similar. We check into our studio, put Gellan in nursery (parking) one last time and call it a day. On Thursday, with the city back in full swing we set off to get all the paperwork ready to sell Gellan. We chose to come back to Santiago to do this (rather than Lima which was the original plan) because selling a foreign car to foreigners is way simpler in Chile than it is in Peru. All previous transactions for Gellan since 2014 have all taken place in Santiago. The previous owners, fresh out of high school and about to sell their first ever car described the process as a piece of cake. And so we set of to the local notaria to get the paperwork. Andy, having handled all the details of the sale walked up to the counter when it was our turn. Behind the counter hide a plethora of different stamps and a row of typewriters. 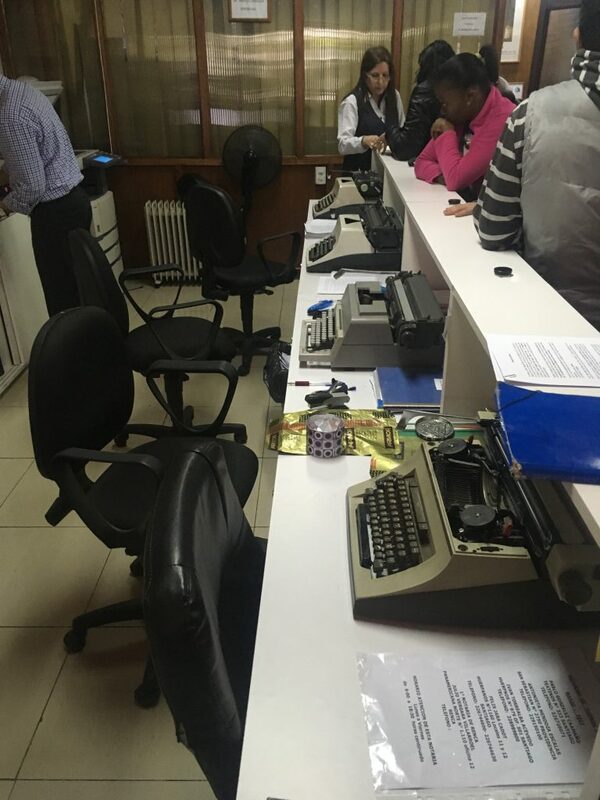 It reminds me of the Kafka-esque offices of Greek tax offices, only surprisingly here there’s much less paperwork lying around. “Have you paid tax?” Was the obvious question from the notary. “Let’s go” I say. “This won’t work”. “Why? We can explain this” But no, the guy is adamant that if the car has Canada plates this is a problem for the Canadian government. We step out in the rain and I look at Andy. We quickly agree that I will handle negotiations due to my slightly better Spanish and my experience in dealing with Byzantine bureaucracies. We head to the next notaria. They refused to provide us with the paperwork as some information on the car’s customs form was written in in a different pen (a customs officer in Atacama noticed a mistake made but his colleague on the Arica border) and corrected it. Notaria number three is closed for lunch time but they are happy to prepare the papers. Refusing to wait for two hours we head to notaria number four. “Sorry, too busy right now with more complicated stuff. Go round the corner”. By the time we get to notaria number 5 we have perfected the pitch. During a quick stopover for sushi we have sorted out Gellan’s old paperwork and have agreed to show them some of the old paperwork to showcase that our request is not that bonkers. We also agree that if this fails as well we will head to one of the notarias that had created the previous paperwork and ask for a repeat (a cheeky request as we would therefore be admitting to being the owners based on a poder rather than the fake Canadian papers we used to get into the county). The woman in the fifth notaria is unsure and heads into an office to ask her boss. Through the ajar door we can see papers being shuffled and reviewed. “No” she tells us. A foreigner to foreigner poder cannot be done. “But look” we tell her and lay infront of her about 8 different examples of foreigner to foreigner poders. Back in the office she goes. More shuffling of papers. More discussion. “Who is the owner?” She asks. “Yes” we say emphatically and bring out the poder giving Andy all rights on the vehicle. “Ok” she says and sits down in front of the typewriter. Side glances are exchanged, fingers are crossed and we wait. Twenty minutes later we walk out with our poder complete with stamps and signatures. Only we are not out of the woods just yet. Her parting words were instructions to go to the Ministry of Justice and get another stamp on the papers. “They will know”, she assures us. Surely enough the next day we walk into the Ministery to find a short queue in front of the Officina Apostille desk. “That’s us” I say. Apostille stamps are all the rage in Greece at the moment. A quick inspection of the paperwork, more stamps, signatures and codes on our poder and we are done. 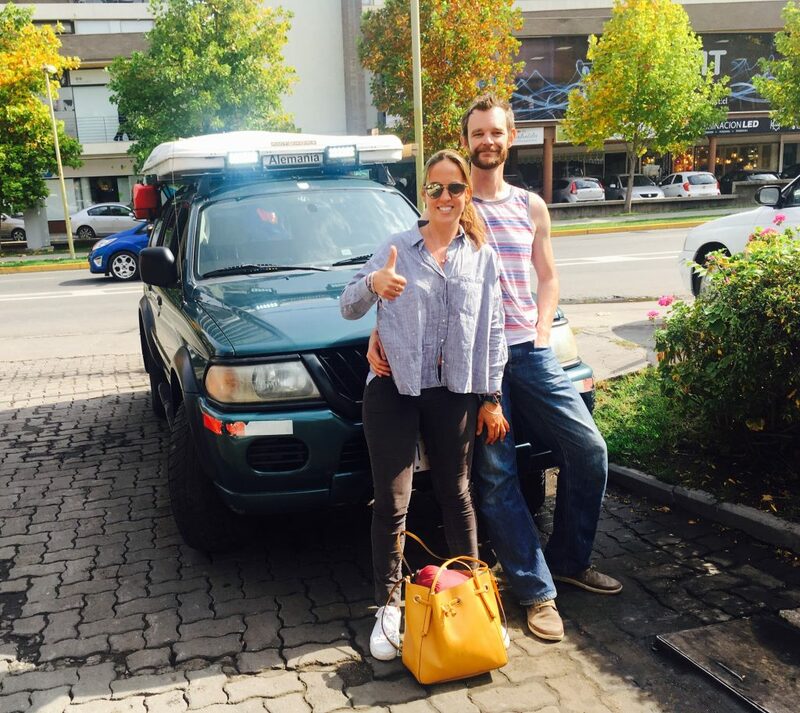 Sebastian, a German guy travelling around North and South America with his girlfriend are now Gellan’s legal owners. The next day we head to a mechanic to have the car inspected and exchange keys for money. Last picture of Gellan. “What would you change if you could spend some money on the car?” Ruth asks me. A list of minor things goes trough my mind. “Nothing” I say. “Everyone of Gellan’s quirks made the trip perfect”.